Jennifer was inspired to write the following post in light of the upcoming first year anniversary of losing her father. She has worked for Williams Funeral Home for almost five years and currently serves as the Director of Finance and Legal Affairs. Jennifer has helped serve many families by writing obituaries, helping with insurance, answering end of life legal questions, and preparing simple estate documents. She shares her journey through grief in hopes it might help others in varying seasons of life and grief. Today I stopped by to visit my Dad. My Dad now resides at Polk Memorial Gardens, well that is where we laid his body to rest. His soul is up in heaven praising Jesus. And while I was leaving the cemetery, I noticed a few others standing over and near the grave of their loved one. One stood in somber silence in The Arbors, and another was taking a photo in the garden of Good Shepard. As I pulled on out of the cemetery, it struck me, here we all are visiting our loved ones, taking photos, talking into the air with no one to audibly answer back, yet we do this because it is how we grieve. I’ve worked in the funeral industry for nearly five years now. I never imagined I would be sitting on the other side of the table planning my Dad’s service at this point in my life. Sure, I figured I’d be planning a service at some point, but not when I was 32, and he was 56. The moments right after my Dad passed, my mom looked up, and in a quite voice simply asked, “What do we do now?” It shook me. I knew what to do next because I’ve worked in the industry. I knew what would happen over the next few days. I knew my Dad would be taken back to TN and prepared for his service. I knew we’d need to bring clothes, send in an obituary, pick out a space at the cemetery. I knew we’d need to pick out a casket (it had to be pine as that was the only thing my Dad really ever requested about his own funeral), choose a vault, select a theme for the memorial folders. I knew we would arrive an hour prior to the public to have family time with my Dad. I knew we would sit on the front row for the service. I knew we would get in our car and follow the hearse to the cemetery. I knew we would get out and see his casket placed into the vault. These are all the things I knew would happen, merely because I work in the industry. My family did not know. They had no idea all the choices and decisions that had to be made, so I made many decisions for them because I could, and it kept me going. What I didn’t know and what no one could fully explain to me would be just how much I would miss my Dad. I mean I knew I would miss him, but the gut-wrenching pain on some days just made it nearly impossible to get up. I didn’t realize just how important having his memorial folder with me would mean. I had no idea the peace that the cemetery would bring. Seeing his memorial and his face each time I visit where his body rests makes it all the more real and at the same time it brings a sense of peace. I have always believed a funeral, and a memorial are not for the dead, they are for the living. I’ve heard this many times. We try our best to educate, but sometimes people are not ready to think of the inevitable. I just want to encourage you to start now. Begin the conversation. Think about your loved ones that you will leave behind. There are many who walk through the funeral doors having no idea where to begin, and they are flat out exhausted. Many people have just spent weeks, or months, or even years making health decisions for their loved one. Sometimes they walk in after losing someone suddenly, and they cannot decide what to eat much less how to plan a funeral. Let me encourage you to plan a service and give your loved ones a place to visit you. This isn’t coming from a person in the industry, this is coming from someone who has lost her daddy. This is coming from someone who sits one week shy of his one-year anniversary, thankful that she has the memory of his service and a place to go and talk to the air. This comes from someone who finds peace at the foot of her Dad. As you may have seen we welcomed our new team member this year our grief dog, Pete. Per our facebook post last week. See below as we reposted an article done by the today show about grief dogs at funeral homes and why they are such a wonderful team member to have! If you stop by for coffee ask to meet Pete. After a child was struck and killed by a train in Fairmount, Indiana, last month, an 11-year-old boy who came to the visitation sat by himself in the front row and just stared at the casket, trying to understand. 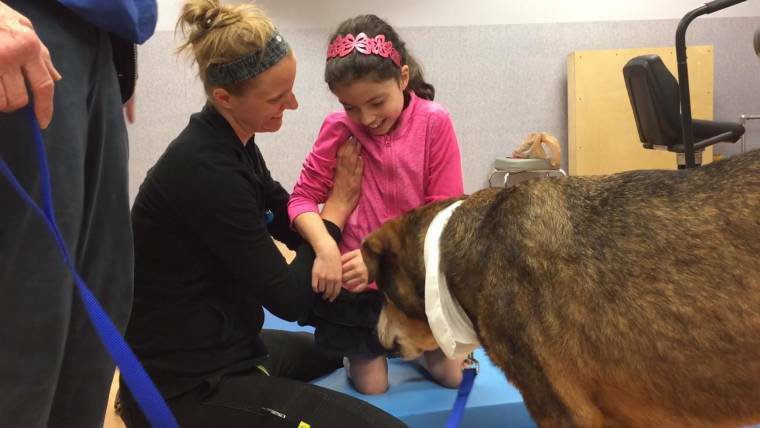 That’s when Judd, a specially-trained 2-year-old golden retriever, spotted him. “He came all the way up to him, sat beside him, put his paw on his leg and buried his head in his lap, and that young boy just cried,” Shari Wallace, the grief therapy dog handler at Armes-Hunt Funeral Home in Fairmount, told TODAY. 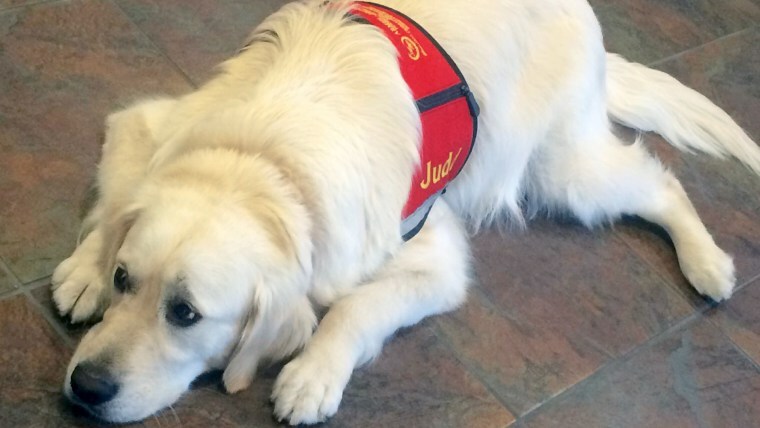 Judd is among the growing ranks of therapy dogs that work in funeral homes, becoming essential “staff members.” There’s Lulu in New York; Kermit in Texas; Dempsey in Ohio; Gracie in Missouri and many, many more. The friendly, furry creatures can be in the room when grieving families make arrangements, and they can attend wakes and funerals, if the mourners wish. It’s always up to the family and Wallace watches closely to see whether everyone is comfortable with the idea. 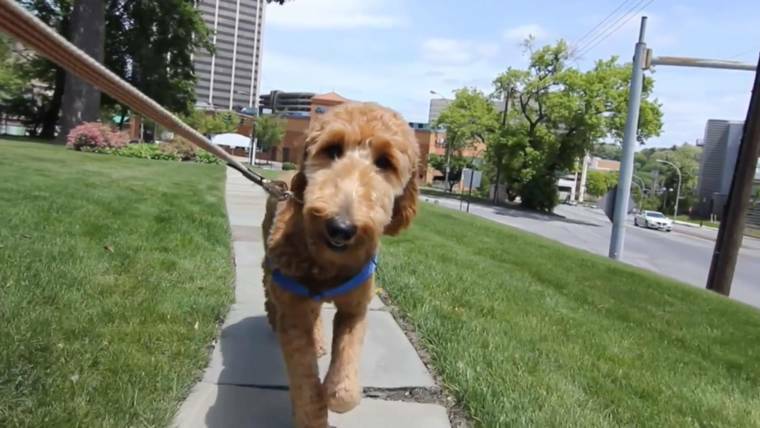 The National Funeral Directors Association doesn’t keep track of how many funeral homes in the U.S. own therapy dogs, but the number has been on the rise in the last few years, said spokeswoman Jessica Koth. In a survey commissioned by the association last month, more than half of respondents said they would be somewhat, very or extremely interested in having a therapy dog present at a funeral or memorial service. A therapy dog can provide mourners with exactly what they need during this stressful time: comfort and the chance to relieve some of their tension and anxiety, said Marilyn Mendoza, a New Orleans-based psychologist who specializes in grief. Stroking an animal has physiological effects. It increases a person’s serotonin and dopamine levels, which can boost mood, and it helps lower stress and blood pressure, she noted. Dogs can also immediately put people at ease. Judd, the golden retriever, is such a big part of the staff at Armes-Hunt Funeral Home that he has his own profile page and Facebook page. 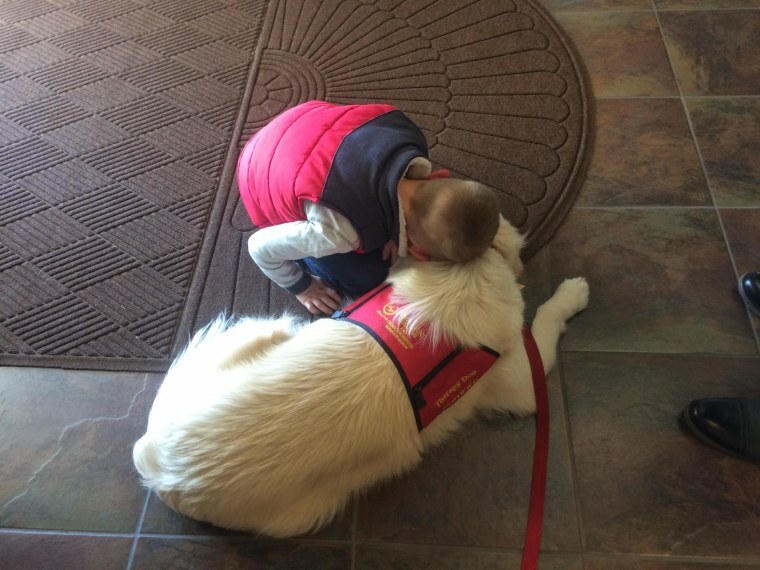 He spent a year in obedience and therapy dog training before he began his mission comforting mourners. When Nancy Hall’s husband passed away last June, she requested Judd’s presence during the visitation and the funeral. Judd does his best work off the leash, approaching people and leaning into them or laying on their feet, Wallace said. He’s different from just a pet hanging around and greeting visitors because he customizes how he interacts with each person. In the last two and a half years of Judd working in the funeral home, there have only been one or two times when a family said, “This is no place for a dog,” Wallace noted. She watches for signs of stress in the dog, who can become emotionally tired after so many interactions with grieving people. To mix things up, Judd visits nursing homes, schools and church events. We have often been asked how does social media know when someone has passed? Or, how do you turn Facebook into a memorial page for a loved one? We have included in this blog a step by step video and directions attached at the bottom on how to do just that. Memorialized accounts are a place for friends and family to gather and share memories after a person has passed away. Memorializing an account also helps keep it secure by preventing anyone from logging into it. If Facebook is made aware that a person has passed away, it’s our policy to memorialize the account. Learn more about what happens to a memorialized account. Please keep in mind that we can’t provide login information for someone else’s account even under these circumstances. It’s always against Facebook’s policies to log into another person’s account. Think about the major life events you’ve celebrated: weddings, births, anniversaries – at the center of it all is usually food that brings comfort and invokes memories. Despite this, we have found some Columbia families are surprised to learn that in addition to our funeral home facilities, we also have our own reception center – the Blevins Hall Reception Center. When we tell families this is an option for them with a funeral, we often hear the question: Why would a funeral home serve food? There are a number of reasons why we decided to offer receptions. First of all, we knew it would be a space our community could put to use for many life events. With its resort-like décor, our neighbors in Columbia use it for family reunions, holiday parties, or professional events. Since we can seat 80 inside and up to 120 people when using our “rain or shine” covered patio with an outdoor fireplace, it’s the perfect space for nearly any event. And if you choose to have a non-funeral related event here, we can make a separate entrance into our reception center available to your guests. Looking to host a larger event like a wedding? We can accommodate up to 300 by utilizing our chapel as well. Since we’re there for families in the first moments after a death, we have seen firsthand the kind of pressure they face during the planning stage. By offering a beautiful and comfortable reception area, we make it easier for them to gather without having to worry about booking a restaurant for a large group or cooking for a crowd. We wanted to be able to handle every detail for families from beginning to end – whether it’s the menu, dishware, set up, linens, and beyond. Having our own reception facility allows us to take care of your family. There’s something about sharing food that brings people together and provides comfort. It can even change your mood. Having a reception before or after the visitation or service gives you a moment to connect with others who loved your friend or family member and talk, remember, laugh, and even cry together. It also gives you the chance to connect with family and friends that perhaps you have not seen in some time. Imagine serving your grandfather’s favorite meal – barbecue brisket and slaw– or treating your guests to your grandmother’s famous chess pie, and then passing out recipe cards afterward. Playing a moving video tribute on our 80-inch televisions. And our state-of-the-art A/V system, including microphones, make sharing your thoughts a little bit easier. Want to host a champagne toast? We can help you make that happen. Just a few more ways a funeral reception can help you tell your loved one’s story. People can come from all over Tennessee, and even the country, to pay their respects to a family member or friend. Sharing a meal is one way to thank them for their support and let them know how much their presence is appreciated. We have helped thousands of Maury County families plan their funeral service ahead of time, and we always encourage them to consider including reception services in their plans. It’s a wonderful gift of love to give to your family – relieving the burden of entertaining their guests as they grieve your loss. It also gives you the chance to express your own personality. Whether you’re the type of person who prefers an elegant, sit-down dinner, or a simple “coffee and cookies” type gathering, the expert hospitality team at Williams Funeral Home & Crematory can make it happen for you and your family. We invite you to tour our facilities any time by viewing our virtual tour online. But really the best way to see it is in person. Stop by anytime – we always have a fresh pot of Starbucks coffee on, and we’d love to share a cup with you. Do kids belong at funerals? We here at the Williams Funeral Home are asked many questions about what children should or should not be involved in when it comes to funerals. For many reasons we hesitate to give answers to those questions because there are many opinions about what may be right or wrong about the effects on children. What we can do however are share some ideas that we have read. The same feeling socks me in the gut every time I walk into a wake or make a shiva call: “I don’t want to be here. This is sad and uncomfortable.” Then my heart and my head take over, and tell me, “You should be here. Take care of the mourners. Honor the deceased.” And that I know how to do, because I’ve been attending funerals since I was a small child. My children’s great-grandfather passed away last week at age 90. Just as surely as we took our 9, 7, and 4-year-olds to visit him (though not enough – it’s never enough), we took them in hand to Great-Grandpa’s wake and funeral. · My kids got to see their extended family at its best and closest: telling stories, crying and laughing together, holding hands. The family was a strong, united One over those days, and we were part of that One. My children belong to something bigger than our little family of five. · They have a chance to see their relatives as whole, complex people. They can learn to empathize, and to provide comfort, instead of seeing Nana only as the bearer of fun and gifts. She had a Daddy too. It was hard for my children to see her sad, but it was also inspiring to see her strength. · Children provide hope. Immediately before the funeral, we made our last prayers at the casket and gave Great-Grandma hugs. As my wide-eyed 4-year-old tumbled towards her for an embrace, Great-Grandma exclaimed, “Precious girl!” and she meant it. Sometimes we need to see something whole and young and perfect when there is sadness all around us, and that’s what a (well-behaved) preschooler can offer at a funeral. · They don’t need to be protected — usually. Kids know about crying. Many of them do it every day. Usually we want them to stop, because it’s uncomfortable for us, and we very badly want our children to be happy. But hard feelings are important too, and we can learn to guide kids through feeling sorrow and discomfort and coming out okay on the other side of those emotions. I would think carefully before bringing my children to an especially tragic funeral, perhaps one for a child or a young parent – something that could be truly frightening – but the funeral of an older relative? This sadness they can manage, and it will strengthen them. · They need practice with funerals. Nobody likes them, but they have to happen. Wakes and funerals can be foreign territory with their singular requirements for etiquette, dress, and behavior. Better to get practice early, when it’s someone the child isn’t as close to, than to layer a sea of funeral-manners confusion on top of truly deep mourning. Just a few months ago, my kids stopped with us at the wake of a quiet, kind man our family knew from church, just to quickly pay our respects. The children didn’t really know Elmer, but they learned what to do and say, and because we’d gone to his viewing, Great-Grandpa’s body wasn’t the first one they’d seen in an open casket. · In learning about death, children learn to treasure human life. My kids’ normal experience with death is throwing a dead tree in a brush pile or squashing ants on our kitchen floor. Perhaps some families also have small goodbyes for beloved pets. But the elaborate ceremony and seriousness of human funerals says something else: This is different, and this is big. We are not trees or ants. In respectful loss, we pass to children a reverence for the irreplaceable gift of each human life. · Funerals connect generations, past and future. Great-Grandpa was a World War II veteran, and uniformed Navy came to his graveside and performed a beautifully moving flag ceremony. It ended with a presentation of the flag to Great-Grandma, and the heart-stopping words: “On behalf of the President of the United States, the United States Navy, and a grateful nation, please accept this flag as a symbol of our appreciation for your loved one’s honorable and faithful service.” Afterwards, I reminded my 9-year-old that in 80 years, he will be able to tell his grandchildren the story of honoring his great-grandpa who served in that important, tragic war that will then be 150 years past. He was just as awed as he should have been by this fact. It’s not easy going to funerals, nor taking kids to them. But it is not our job to make our children’s lives easy, and it is our job to parent and guide through the hard things too. You can do it, and so can they. We will post a follow-up blog about niches, and columbarium burial and why we believe like the Catholic Church does that burial is best even if cremated. The Vatican has issued new guidelines recommending that the cremated remains of Catholics be buried in cemeteries, rather than scattered or kept at home. “Following the most ancient Christian tradition, the Church insistently recommends that the bodies of the deceased be buried in cemeteries or other sacred places,” state the guidelines released Tuesday by the Vatican. The guidelines do not represent a change the church’s overall policy on burial and cremation, but rather underline “the doctrinal and pastoral reasons for the preference of the burial of the remains of the faithful and to set out norms pertaining to the conservation of ashes in the case of cremation” in light of the increasing popularity of cremation in many countries, according to the introduction of the document. Cremation has been steadily growing in popularity in the United States. According to the Cremation Association of North America, an industry group for cremation-related businesses, nearly half of all people who died in 2015 in the U.S. were cremated, up from about a quarter in 2000. The creation of jewelry and other ash-containing mementos is also explicitly prohibited by the guidelines. Since its founding, the Roman Catholic Church as an institution has always preferred burial to cremation. For periods, cremation was outlawed entirely. However, since the Second Vatican Council, the official position of the church has been that cremation, while not preferable, is also not banned. The Funeral Crowd. What should you say or not say? How do you console someone in the time of death? People always seem at a loss of words whenever confronted by these situations. A few of the responses I heard…. This is the tried and tested phrase used for all kinds of losses when you are trying to cheer someone up. Somehow, it is horribly inappropriate during a funeral and even imagining that as a way to console someone riles me up. Obviously, death is not okay. And yes, I will get over it in the future but that person is not going to be a part of my or anybody’s future. That’s what I am sad about. A downpour of sympathy. This statement evokes only one feeling. Utter helplessness. Facing a sudden loss is like someone slapped you in the face and didn’t even bother to wait and watch how you took it. You are still reeling with the shock of it and simultaneously accepting condolences from everyone. You just nod along to such responses because they don’t really mean anything to you at that moment. But they do help you. They act as a balm for the shock and help the actuality to sink in. This is usually being said to the spouse/children of the deceased, in reference to each other. I can understand the whole intent behind this statement and the kind of self sacrifice it demands. In other words, they are asking you to fast-track your grief. A subtle reminder that your responsibilities are doubled now. Come through fast before this horrible reality catches up and starts mutilating other aspects of your life. The harsh reality either pains the bereaved so much that they are howling for it to stop or has numbed them into silence with a vacant look in their eyes. Something about watching that entire scenario makes me tear up, which has nothing to do with the deceased. After all, it didn’t affect me so when the body was actually laid on the pyre and lit up. It is the state everybody is left in. Some are still in the primitive stage of denial. Some are left wondering, how will life ever go on again? And all this while, a few brave ones are already picking up the pieces of their shattered lives….